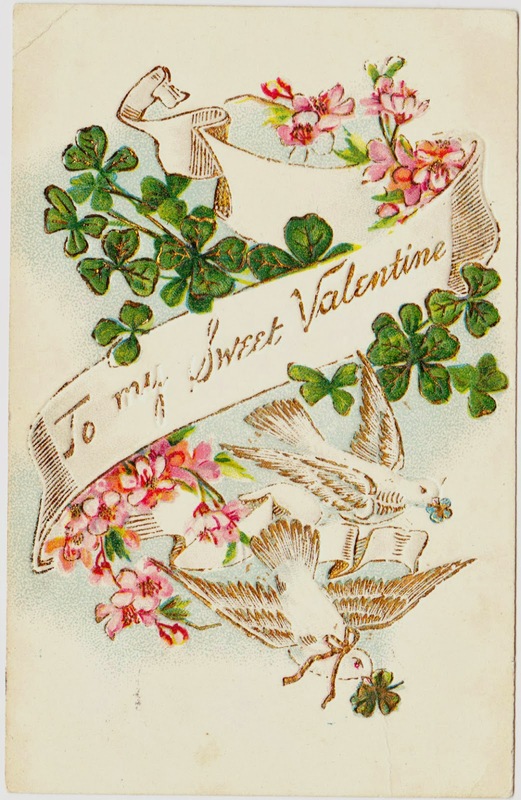 Continuing with the Valentine's Day-themed ephemera, here are a pair of postcards that are more than a century old. It's interesting to see how pink, green and white were the predominant colors on these postcards. Now, that could just be a small sample size. But red is certainly not the overwhelming color in these illustrations, as it is today. 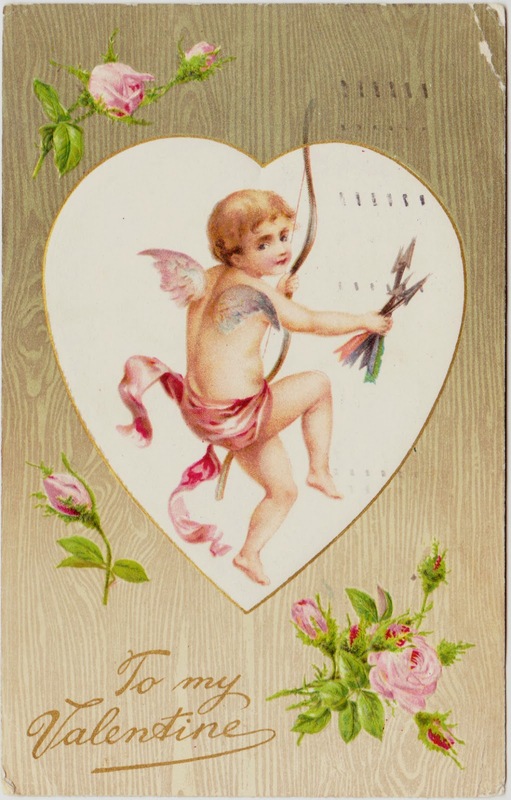 Above: This postcard features a Cupid-like figure, with some dangerous-looking arrows, on the front. It was postmarked at 7:30 p.m. on February 12, 1908, in Jersey City, New Jersey.2 And it was mailed to Miss Naomi Snyder in Spry, Pennsylvania.3 The note simply states "FROM SAM." The postcard was printed in Germany. Very old Christmas card (and more) inside 1890's "Triumphant Songs"
2. Also on February 12, 1908, French mathematician Jacques Herbrand was born. He would only live to age 23, as he died in a mountain-climbing accident in the French Alps, but he left an important legacy in his field. 3. Of minor interest: I found a Mary Naomi (Snyder) Smith Figdore, who is buried in Spry, on Find A Grave. But she lived from 1911 to 2010, which means she was born three years after this postcard was sent. Her mother's name was Dollie V. Snyder, so that's a dead end, too.